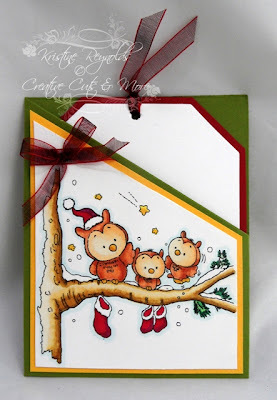 Today I have a fun Christmas Tag Card to share with you. I started with a die cut Slash Pocket with Tag from Creative Cuts and More. I stamped this image from Mulberry Wood-Wish Upon a Star. on a white panel in black Memento Ink and colored it with Spectrum Noir Markers. Then I trimmed the panel down to fit the front of the card. I left the tag blank so I could write on it. 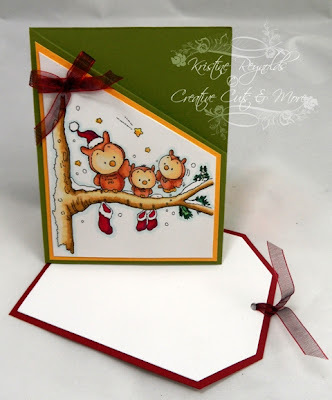 I love this die cut Slash Pocket with Tag from Creative Cuts and More because it allows you to make a unique card that looks like it took a lot of time. You can find more die cut tag cards HERE. Creative Cuts & More is a leader in the die-cutting industry. We have a huge variety of bags, boxes, cards and shapes. We offer these die cuts in chipboard, acetate, felt, velvet paper and in name-brand cardstock including Bazzill Basics, Stampin Up!, Stardream and Curious Metallics. Save time & money by having us cut it for you! Be sure to visit the Creative Cuts & More Store and while there check out the hundreds of samples in our Art Gallery. Criss Cross A7 Coming Soon!!! Criss Cross Card - A7 Coming Soon!!! All the materials posted here are Copyright 2009 Creative Cuts & More and/or their respective owners. Diecut Diva header graphic created by Black Crow Designs.